The No. 19 Quinnipiac Bobcats fell 4-2 to the Clarkson Golden Knights on Friday night at the High Point Solutions Arena damaging the teams chances at an ECAC first round playoff bye in the process. The Bobcats had come into this lone game on the weekend fresh off a sweep of Brown and Yale on the road last weekend and were looking to pick up key ECAC points. Clarkson had other ideas as they hope to end the weekend trailing Quinnipiac by only one point in the standings. The Bobcats turned back to freshman Andrew Shortridge in net who saw action in one game last weekend in the shutout against Brown. 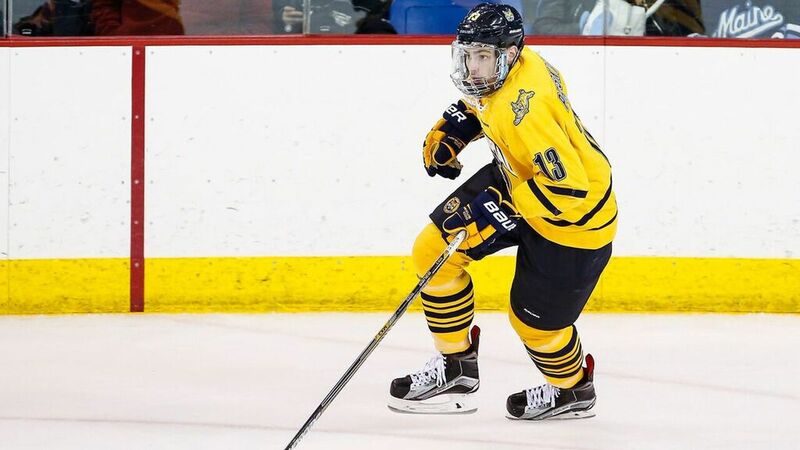 Quinnipiac got the scoring started just 3:16 into the game when Tim Clifton won a draw in the Clarkson zone and got the puck back to Chase Priskie at the point where he blasted home his 7th goal of the season. The Bobcats continue to dominate the possession game in the first period as well as the shot total. They ended the period out shooting the Golden Knights 17-9 in the opening frame. In the second period the Golden Knights tied the game early in the period at the 1:59 mark when Aaron Thow fired a slap shot from the top of the right circle right as the power play was expiring. Troy Josephs and Sam Vigneault picked up assists on Thow's second goal of the season. Just 12 seconds later Clarkson's A.J. Fossen was assessed a hitting from behind penalty on Chase Priskie that earned him an ejection and gave Quinnipiac a five minute power play. The Bobcats could not capitalize on the ensuing power play which swung momentum towards the Golden Knights who continued to outplay Quinnipiac throughout the second period. Late in the period Greg Moro scored on a one timer from the point giving Clarkson a 2-1 lead going in the second intermission. The Golden Knights out shot the Bobcats 10-6 in the middle frame. Clarkson extended the lead to two goals just three and half minutes into the third period on a James de Haas goal off a rebound from a Sam Vigneault shot that ripped off the post. de Haas was wide open with no one around him with a net that was essentially wide open. Haralds Egle also picked up an assist on de Haas fifth goal of the season. 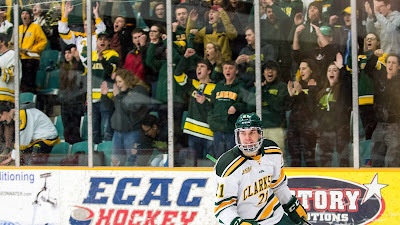 The teams traded back and forth play for much of the third period until Quinnipiac cut the lead to one on a goal by Kevin McKernan after a lot of chaos in the crease in front of Clarkson goaltender Jake Kielly. It was the third of the season for McKernan who has shown more offensive out put this season from the blue line. Bo Pieper and Landon Smith got the assists on the McKernan goal. With just over three minutes to play head coach Rand Pecknold pulled Andrew Shortridge for the extra attacker and while the Bobcats got some good offensive zone pressure it was Clarkson's Sam Vigneault that put the game on ice for the Golden Knights with an empty net goal. Andrew Shortridge made 27 saves in the loss while Quinnipiac out shot Clarkson 35-31. Quinnipiac falls to 16-12-2 (10-7-1 ECAC) while Clarkson improves to 13-12-4 (8-7-2 ECAC). The Bobcats are currently 23rd in the Pairwise Rankings. After the rest of the weekend off the team heads up to the capital district to face off against Union and RPI.